Getting thru immigration was much easier than I anticipated as a US citizen… only a few questions about where I was going to be staying throughout my visit and a quick photo. Although I love my country stamps, I was thankful that the immigration officer knew NOT to stamp my passport. (Even though I was travelling legally to Cuba, I did not want to have difficulties returning to the US, or issues with future travels). When I got to baggage claim, I had a déjà vu moment… The Frank País International Airport, in Holguín reminded me of when I had landed at the Alejandro Velasco Astete International Airport in Cusco, Peru in December 2011. Both airports are relatively small and quiet, and look very, VERY similar. The big difference was once I walked outside and saw classic cars everywhere. To walk the streets of Cuba one must go back in time… way back… Welcome to Holguín! The hour ride to downtown Holguín passed rather quickly as I was so caught up in taking it all in. Landscape-wise, I could have been in rural Arizona or even many cities in Mexico, with the notable difference being transport. The primary mode of transportation for most Cubans is walking, riding a bike, horse, or donkey, or catching a ride on a bicitaxi (bicycle taxi), or a horse/donkey/ox driven cart. BRAVE souls may take the bus, which look like old US army trucks covered with tarps that they squeeze into like sardines. 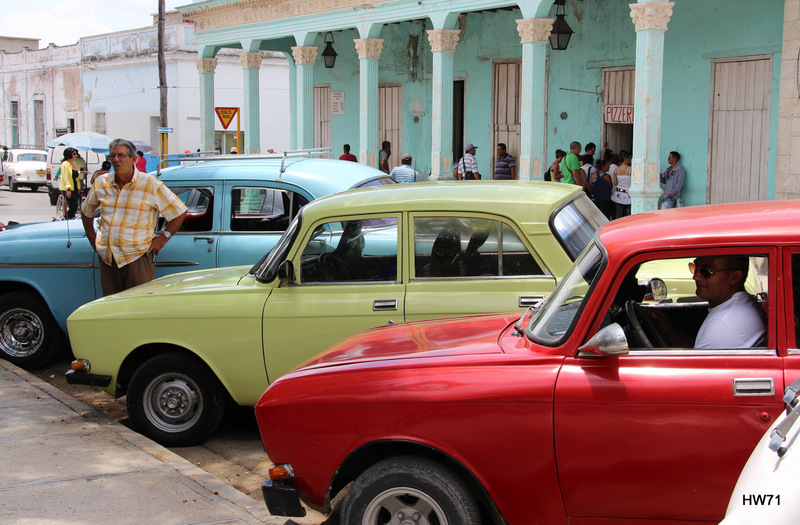 There are quite a few classic cars (manufactured prior to 1950) on the streets but most are taxicabs (taken by European and Caribbean tourists) as most Cubans cannot afford to own a car. We made a quick stop in downtown Holguín to eat lunch (at Restaurant 1720) and exchange money, before our VERY LONG journey to Baracoa. Standing in line at the bank is where I first learned of the Cuban national pastime of waiting in queues… I also directly felt the impact of the US/Cuba foreign policy… Americans cannot use credit or debit cards in Cuba because of the US/Cuba trade embargo, and must rely on cash. Although we are allowed to exchange American dollars into the tourist currency (CUCs – Cuban Convertible Peso), we are taxed a 10% penalty in addition to an exchange fee. Thus, many of us exchanged our American dollars into Canadian dollars prior to departing the US. Getting to Baracoa was quite a feat… The 3 hour route from Holguín to Moa consisted of a 2 lane, partially paved road shared by lots of donkey/horse/oxen driven carts, bikes (manual and motor), bicitaxis, pedestrians, roosters and chickens, goats, a few classic cars, an occasional stray dog, and two wild pigs. The countryside was rugged yet lush with vegetation and very beautiful. The 70km journey from Moa to Baracoa proved to be quite a challenge due to HORRIFIC road conditions (mostly mud and rocks). However, the picturesque Baracoa was well worth the very treacherous, extremely long, 4 hour drive from Moa. Thank you for your kind words! I am happy that I have inspired you to write 😊. Pls let me know if you get a site up and running as I would love to check it out. I do believe all the ideas you’ve introduced in your post. Thank you for your suggestion! I will try my best to add more details when I get some time 😊. Good information. Lucky me I ran across your blog by chance (stumbleupon). written article. I’ll be sure to bookmark it and return to learn more of your helpful info. Enter your email address to follow iluv2xplore and receive notifications of new posts by email.